Banks and mathematics courses will talk about how monthly compounded interested is better than yearly compounded interest. You might even see a demonstration of it such as this one dealing with 6% yearly interest. Which shows that a 6% interest rate, when compounded monthly, provides a slightly higher amount of interest. Now, the amount of increase you get is dependent on your base interest rate. In our example, a 6% interest rate becomes a ~6.17% interest rate. A 12% yearly interest rate becomes a ~12.68% interest rate, which is a far better gain than what 6% achieves. But a 12% interest rate is incredibly unlikely to get anywhere. So why am I calling this a myth? Well, because it's only better than yearly interest under certain conditions. The example they give you presumes that you aren't depositing or withdrawing money from the account. And if you're not depositing or withdrawing money from an account, what good is it? It's either a small amount of money, in which case the additional interest in negligible. If it's a large amount of money, then the person is likely financially secure or wealthy, so they could benefit significantly from the increased interest. Suppose you're depositing money into the account every month. If you have monthly interest, then a small amount of interest is applied to small amounts of money at the beginning of the year, and larger amounts of money at the end of the year. If, however, you have yearly interest, all of the interest is applied to a large sum of money at the end of the year. Why apply interest to a small amount of money when you could instead have the interest applied to a large amount of money? The question then becomes, how big of a deal is this discrepancy? Well, I'm glad you asked. I used an R program to come up with some numbers for us. I used a 6% yearly interest rate and invested in the account at $300 per month. Now, the $300 figure isn't important, these results will hold true no matter what the amount is, $300 just seemed like a good figure to work with. From this, it would appear that the yearly interest is always better than monthly interest, but when you carry the calculations out you find that monthly interest will eventually exceed yearly interest. From this chart, if you have a 6% interest rate and deposit money at a constant rate, then monthly interest overtakes yearly interest at the end of the year only at year 27. Monthly interest accounts exceed yearly interest accounts in the middle of each year because of the interest that is applied during the year, but at the end of each year prior to year 27, yearly interest comes back. From this graph we see that yearly interest provides, at most, a $1161.17 advantage (with a $0 initial balance and monthly deposits of $300). This scales as long as your monthly deposit is the same. So the advantage maxes out at roughly four times your monthly deposit. There is another situation where compound interest is better. When the amount of money in an account is in decline, it is better to have compound interest because then the interest will be applied when you have more money (before you lose said money). So what affects whether monthly or yearly interest is better? The factors are your initial balance and how much you invest each month. If you have a high initial balance, then monthly interest should always be better. 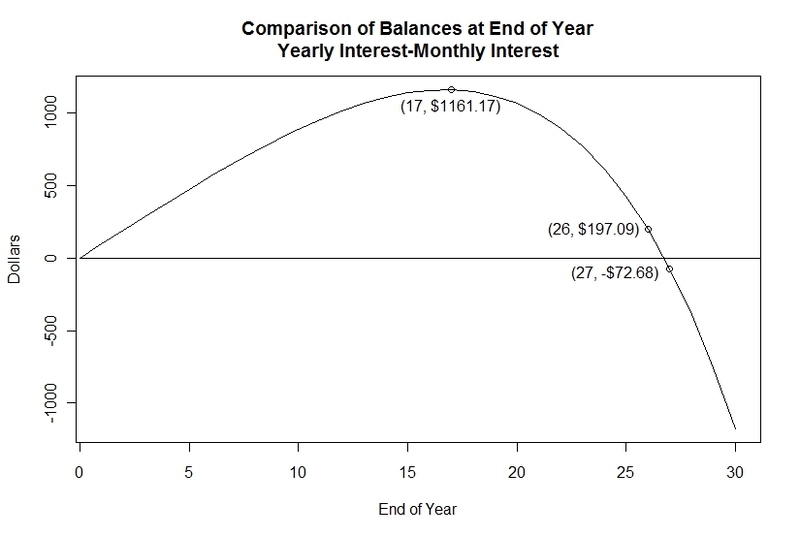 If you have little to no initial balance, yearly interest will be better for a long time. If your investment rate increases with time, such as starting by depositing $100 and depositing more and more as time goes on, then yearly interest will stay relevant longer. So banks tell you about this wonderful thing known as compound interest when it isn't necessarily better for you. I know how you all must feel right now. I mean, how could the banks betray you like this? It's just so hard to believe that they could be like that. I mean, that something they would tell you is a good thing can actually be a bad thing (unless you are financially secure enough to save a large amount of money for a long time. I think I'll do a followup post that investigates some other investment situations. Keep an eye out for that.